New Ark Mission of India is an organization focused on rescuing and rebuilding the lives of the destitute and dying people of the streets of Banglore in India. 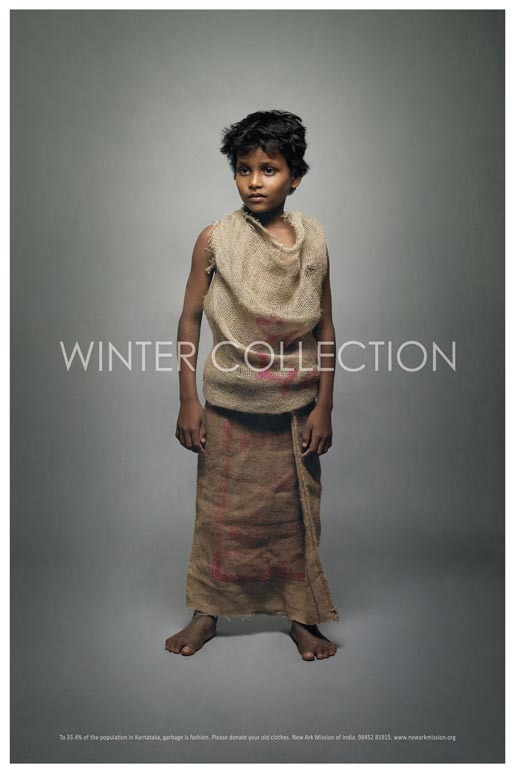 It’s the winter months that takes its most violent toll on India’s poor. After long hot summers, the poor are really not ready for the extreme cold that follows. On top of this, street children and beggars are a blind spot rarely acknowledged. Ogilvy Bangalore dressed up street kids in their usual everyday clothes, made from discarded newspapers, sacking, cardboard, and photographed them walking the ramp. This juxtaposition of the usual in an unusual setting, startled and woke people up. 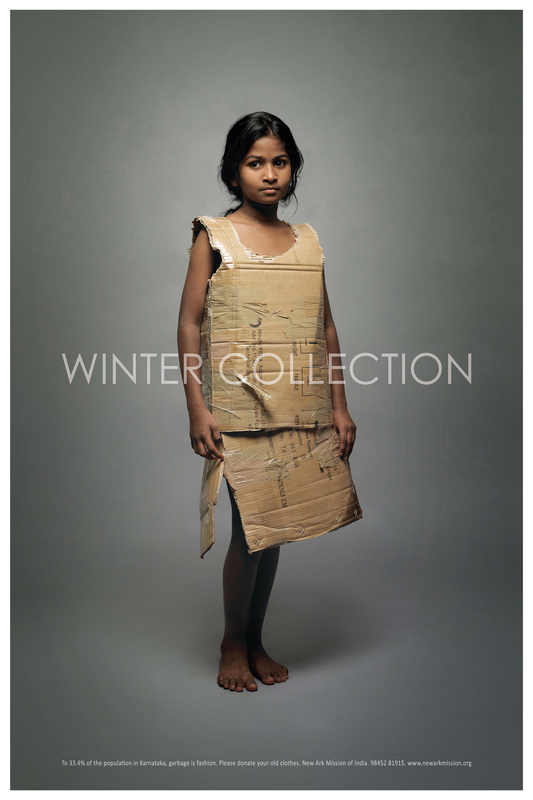 The campaign was executed as a series of posters, standees and eDMs in corporate offices and churches. New Ark Mission was hoping for about 3500 sets of clothes. However, they were overwhelmed when they received over 6000 sets of clothes as well as significant monetary contributions. 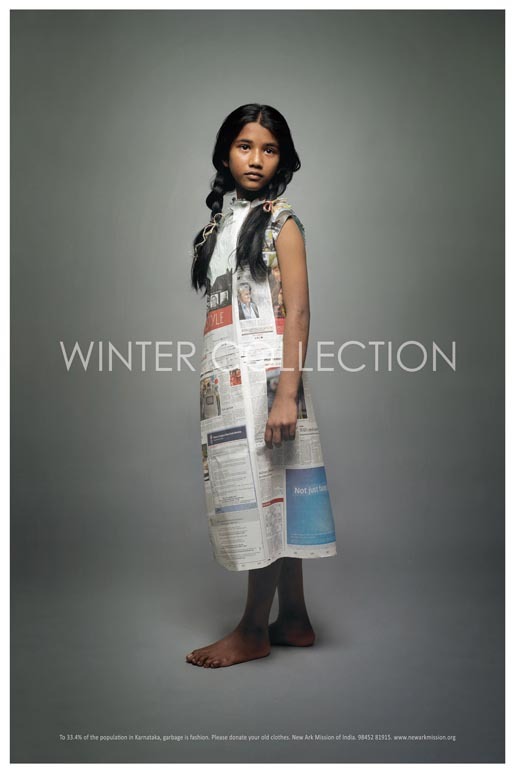 The Winter Collection campaign was developed at Ogilvy & Mather, Bangalore, by chief creative officer Piyush Pandey, executive creative director Ajanta Barker, creative directors Gautam Dev and Neel Roy, art director Siju RS, photographer Senthil Kumar, and producer Mubina Vaziralli.